I remember from my old boy scout days the scout “motto” was “Be Prepared.” Well October first is fast approaching and it is time to get your act together concerning the upcoming bow season. I drove over to my lease property this morning in Hillsdale thinking I was prepared to take care of business. The first thing I did was check out my “hay blind.” We’ve had a lot of rain this month, and the ole blind didn’t fare to well from all the moisture. I had placed a tarp over the roof of the blind, but evidently the wind blew part of it off, and some of the bales fell to the ground. At this point it does not look like this experiment is going to be a rousing success. Oh well, if it doesn’t pan out I at least have some feed for the deer. Next I attempted to put my rivers edge 20 foot tree stand up. I am not a tall person (5-7) but I am stout (225), and do you think I could get that darn 89 pound ladder stand in a vertical position? I think “physics” comes into play here somewhere! Not to mention the fact that I haven’t lifted weights or worked out in many moons. Anyway this “little girly man” had to leave the rivers edge laying on its side-horizontally. Part of “being prepared” has to do with being in good physical condition. Looks like I start hitting the weight room, before I can’t even lift my bow and arrows. Next I cut some shooting lanes, and did a little scouting for deer sign. One of the areas I hunt, the woods butts up to a 120 acre corn field. I was dumbfounded to see the amount of corn stalks laying on the ground. No wonder farmers complain about crop damage from deer. This farmer will loose many acres, to the deer, before he picks his corn this fall. 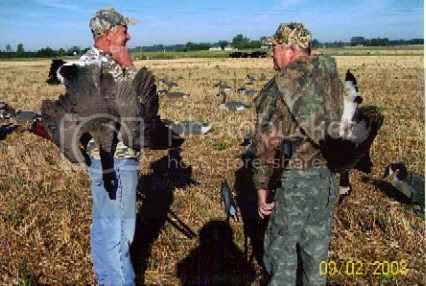 While I was driving to my area I saw several other hunters doing the same thing I was doing-getting prepared. I will be going back over, in a couple days, with reinforcements to tackle those ladder stands. I tried to get help on this trip, but seems no one wants to help bake the pie-they just like to eat it! 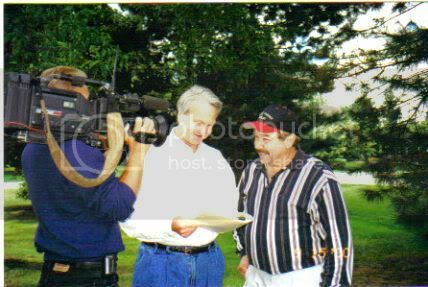 My last blog, which included some very fond memories of my dad, seemed to invoke similar thoughts from a lot of you readers.� I really appreciate your comments and the insights you share back with me.� This is not a very flattering picture of myself, brother Darryl, and “Papa Bear,” but its one of my favorites of my dad. This was our very first bear hunt out of the Baldwin camp, and Darryl took the first bear.� I wore my hair quite long in those days, and dad didn’t care for it very much.� In fact he made me a little proposition.� If I shot a bear-I had to go into town and get a hair cut.� Of course I wasn’t thinking of that when a nice “blackie” came strolling past my blind, but my dad hadn’t forgotten. He reminded me the next day, when we went into Marquette to check our bear in, so begrudgingly I got “clipped.”� It wasn’t that big a deal, because by Christmas it was long again.� We had a great time on that first Upper Peninsula hunt, and the Ansel family will always be grateful to the Baldwins for sharing it with us.� I can’t wait to get back in the “boonies” this fall, and create some more memories. “My Dad, Brett, Darryl, Me, Randy. Is this a good looking hunting crew or what? From left to right is Brad, Darryl, Brett, Randy, Myself, (Mike) and Dean. This picture was taken a few years after my dad Norm passed away, and I am wearing one of our family’s most prized possessions-my dads hat. 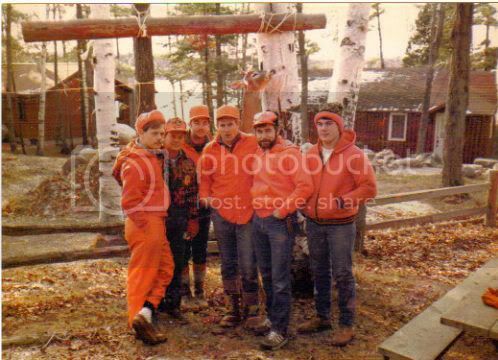 We were at North-Shore-Resort in Lewiston, my dads favorite hunting area. Well I’ve had that gun for almost 30 years myself, and just a few years ago I took my fifth buck with it. That matches the five bear it’s dropped, but the value of the gun is not in the amount of game its taken. This cherished “sidekick” is chucked full of memories-great memories that I wouldn’t take a zillion dollars for. Every time I touch it, clean it, carry it, shoot it, my dad talks to me. Sometimes its serious stuff, and sometimes we just laugh. Its not all that unusual for a tear to hit the ground, as papa bear comes walking back through the still fertile soil of my memories. I ended up giving dads hat to one of my younger brothers, who insist that you can still “smell” dad if you sniff the inside of his hat. Every now and then we all need a sniff, a touch, or a memory of the loved ones that helped us become the people we are, and who loved us unconditionally. Thanks dad – you left behind more “trophies” than you ever realized. This Is Not The Way To Get On T.V. A couple of years ago I read an add to lease a piece of Upper Peninsula property totaling 8000 acres. It was located in the Huron Mountains, and was home to the famous Hartford buck! (whatever that was) The rock bottom price of $99.00 included a camping area, a lodge for all to use, fabulous deer and bear hunting, streams loaded with trout, 4-wheeler trails, and year around access. This add ran in several major newspapers, and also the Michigan Outdoors Magazine. There were limited openings, so you had to act fast. It didn’t take me long to send in my check, and I couldn’t wait to see my little-bit-of-heaven around Gwinn. What a joke! The guy running this scam was a convicted felon, and he sucked in thousands of people, and 10’s of thousands of dollars. He actually only owned a couple hundred acres that joined Mead Paper Company lands-therefore the 8000 acres! There was no camping area, and the lodge was a 16 foot trailer that had been abandoned for many years. The gate had a huge lock on it when I arrived, and the only way to check it out was to cross the neighbors property. Needless to say the other landowners in the area were up in arms over this crook, and they were screaming to hi-heaven. 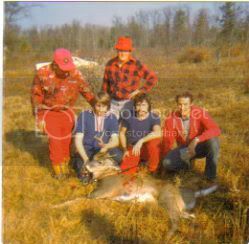 The Huron Mountains were about 80 miles north of this area, and the Hartford buck was from an insurance commercial! I just wrote it off as a live-and-learn experience, and kept pretty tight-lipped about the whole scenario. That is until Channel 2 news called me to see if I would give them an interview for their “Hall Of Shame.” Several people who had been swindled had called Channel 2, and somehow they got my name. They hunted the crook down, after they took a little trip, with camera’s rolling, to report on “paradise!” They didn’t get much of an interview with the flim-flam-man, but they quickly nominated him into their “Hall Of Shame.” So that’s how I ended up on T.V. doing my 2-1/2 minutes of fame. Oh by the way, my wife said “I told you so!” Why does she have to be right all the time? 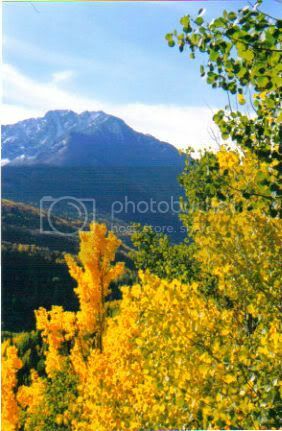 One of my daughters and son-in-laws has a time share, and twice they have taken us with them to Vail Colorado. It is one of my favorite places to go in all the world. My son-in-law Glen loves to fish, and so do I, so we always try to find some good stream fishing off the beaten path. The picture, at the top, is some of the scenery we had the honor to be part of, as we worked our way back to our “fishing hole.” I will be blogging more, at a later date, on some of these trips after I come up with some more pictures. Its interesting to note that not all these “big boys” were old timers. The youngest bear taken to date, that qualified for the Pope and Young archery record book, was a 4-1/2 year old male. 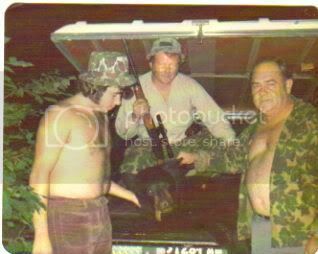 This particular bear had a live weight of over 300 pounds, and was taken with a recurve, by Mark Davison a family friend. My brother Darryl filmed the whole exciting hunt, including the “pass through” perfect shot Mark made. When ever possible we try and record our hunts on video, and over the years we’ve compiled quite a few bear on tape. We have learned the ins and outs of being successful cameramen. To me this is just as exciting as the hunt itself! I will be filming for my brother Darryl this year, and I’m really looking forward to it. Other record class bear taken on this same property have been 11-13 years of age, with weights in the 450 pound area. Over the last several years other bear hunters have discovered our little secret, so the extra hunting pressure has seemed to change the bears habits. We have noticed a much smarter/cautious bear now roams these parts. Thats alright with us, as it makes it even more satisfying when you fool one of these hunter wise bears. Recently I wrote an article for the Monroe Evening News concerning the widespread� problem with “boar gone wild” here in the state.� Some important information was edited out of the article, so I’ll try and pass it on here on my blog. The Agricultural Dept. 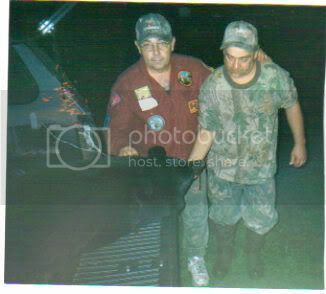 has been working with prosecuting attorneys in at least 32 counties where swine have been reported, and those prosecutor’s have agreed not to bring charges against hunters who shoot feral swine.� The M.D.A./M.D.N.R. would like hunters to submit samples for surveillance testing.� Samples can be dropped off at any D.N.R. office or check station.� The D.N.R. will convey those samples to Michigan State University’s lab for disease testing at no cost to the donor.� Reports of sighting or kills can be called into the D.N.R. at (517)-336-5030 or at the M.D.A. at (800)-292-3939 then press 4 for the animal industry division.� Laboratory technician Kristine Brown of the Department of Natural Resources can also be reached at (517)-336-5047 or e-mail her at brownkr@Michigan.gov. 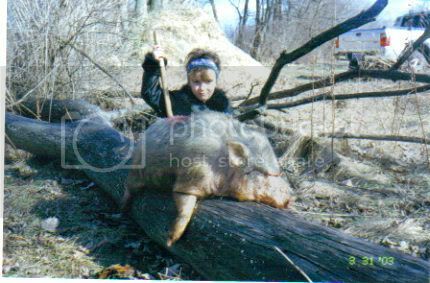 five feral swine (wild boar) had been reported killed in Michigan over the last 15 months. These hogs spend a lot of time rooting and wallowing.� This contributes to soil erosion, reduces water quality and damages agricultural crops.� They forage heavily on acorns, competing with deer and turkey for this important fall food source.� They commonly eat the eggs of ground nesting birds, and have been reported to kill and eat fawns.� Feral hogs are known to carry diseases such as swine bruceliosis, psuedo-rabies, trichinosis, and leptospirosis.� Statistically one sow and one boar could produce over 1200 breeding adults and 5000 piglets in a 5 year period.� This could well be what the future holds if this Michigan invasion is left unchecked. As Paul Harvey would say “Now thats the rest of the story.”� To read the first part of this article go to MonroeNews.com and look up page 4B. There is a small pond on the property where I deer hunt in Hillsdale. When I was over this spring, looking to bag a gobbler, a pair of geese where often seen cruising the little pond. They didn’t like having me around, and would become quite vocal if I got too close. I was sure they were going to nest somewhere nearby, and they did. They hatched eight gosling’s in early spring, and really didn’t appreciate my presence, once they had little ones to protect. Any time I visited the property I’d stay clear of the pond, as much as possible. Anyone who has ever been attacked by an angry goose knows it is serious business! When I was a kid a neighbor boy had a pet fox. They also had some nesting geese on their property, and one day the semi-adult fox got too close for his own good. One of the geese took exception to the foxes intrusion, grabbed him by the back of the neck, shook him violently, and that was the end of Mr. fox. Moral of this story-steer clear of geese with attitude. Recently I was back in Hillsdale, and snapped this picture of the family of geese taking off from the pond. Two geese came to visit, and ten geese flew away. Looks like mama and papa goose did a good job of raising their offspring without loosing even one to the foxes or coyotes. Sunsets are some of the most beautiful parts of Gods handiwork. From time to time I actually catch a good one with my camera. Sometimes the printed picture does not do the scene justice, but this one, I thought, was really special. 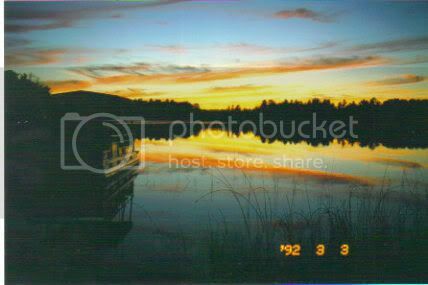 Our good friends Gary and Nancy Baldwin own a fabulous place on 16 Mile Lake around Munising in the Upper Peninsula, and we have had the prividledge of staying there on several summer vacations. Its one of the nicest get-a-ways we have ever experienced. One of the reasons this picture is so special is what happened, in that very spot, a few hours earlier. We were just coming off the water, after fishing from the pontoon boat, when I looked up and saw an eagle circling overhead. Now seeing an eagle is not that rare anymore, but what happened next may be! As we stopped to enjoy the visual image of watching our majestic national symbol, the eagle started a headlong dive toward the lake. Right before our eyes he pulled up just above the water, and with outstretched talons snatched his dinner. The thrashing fish could not escape the grip of this talented fishermen, and he flew off in the direction of his nesting area. I have never seen such efficiency at work in nature. I was so mesmerized by the whole scene that I forgot I had my video camera strapped around my neck. I let the Kodak moment “fly” away. The date on the picture is not correct, and my light still flashes on the v.c.r. Three years ago on our annual Marquette bear hunt I had a close encounter of the black bear kind! We have a beautiful piece of property that we bear hunt on, but we also hunt state land. Actually we’ve taken more black bear on state land than we have the Baldwin’s camp. This particular year I had found a really good looking spot on state property, with tons of bear sign. We had been baiting about 10 days before the season opener, and the bait was getting tore up. I put up a stand using the metal tree steps that strap to the tree. The stand was positioned in a stand of hemlocks, with a 15 yard shot to the bait. The first night out I decided to use my muzzle loader, as I had never taken a bear with a smoke-stick. Just before dark I heard a branch break behind me. I didn’t turn around to look, as I didn’t want to give away my position. Next thing I hear is heavy breathing right below my stand. It is so dark, in the stand of hemlocks, I can’t see the bear directly below me. Then I hear bear claws on metal tree steps! This is not good, as I have one shot and I can’t see what I’m shooting at. My tree starts to shake, and I can hear claws scratching bark. I am tempted to turn my flashlight on to see if I’m in any real danger. Then it gets real quiet, and I see movement out in front of me. The nice sized bear circles in front and comes confidently into the bait. I can see the bears outline, but cannot see my cross hairs when I put it on his chest. I won’t take the shot-its just to dark to chance it! Well, its time for me to go one way, and Mr. bear to go the other. I pull my ram-rod out and bang it on the metal stand. The bear in the bait takes off, but the one below me starts woofing and popping its teeth! I had no idea there were two bear in the picture. I then yell “You better get out of hear bear!” The bear retreats, but he goes right down the marshy path I need to leave on. As he walked away I got a glimpse of his rear end. It looked like a Mack truck! I mean this bear is big, and he seems to have attitude. Where’s my Remington Woodsmaster when I need it? I did what I had to do to let that bear know he was messing with one of the Ansel boys, but I was truly relieved to make it to my truck unscathed. We let that bait sit one night because of all the commotion, and when we baited it on the third morning it had been hit again. My brother Darryl walked over to my stand, and called me over to look at something. Seems I placed the stand right smack-dab up a “territorial marker tree.” No wonder I had so much activity going on below me! I gave the excuse that it was dark in the Hemlock grove when I put the stand up, and most of the claw marks were on the backside of the tree. No matter’ dumb place to put a stand! 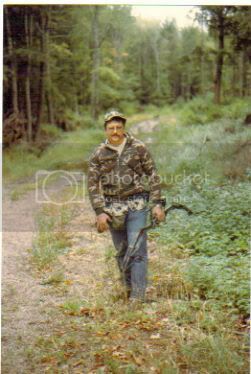 My son-in-law Tony was with us on this hunt, and he had never taken a bear. I decided to let him hunt this active stand with his semi-automatic rifle. Later that evening he dropped a beautiful “blackie” on the spot! Its good to be able to share with friends and family in the adventure of the hunt. Tony was tickled-pink, and had a nice rug made out of his 275 pound bear. Next time I hunt this area I’ll be more careful where I place my stand. Thats Tony on the right with his favorite father-in-law.